WIW all summer: black white & blue. So I've been somewhat scarce lately. I may have something to say about this in an off-topic post at some point, but suffice to say I've cut back drastically on social media while I try to get my chaotic life into some kind of order. And I've been pretty slack on taking photos lately, so there's that. But I haven't forgotten you guys and it's always a pleasure to look in on what you're all wearing, so I'd like to return the favour and share a few looks I did manage to shoot. I've been dressing almost exclusively from a very limited colour palette this summer. This is some sort of challenge or experiment, as I find myself increasingly attracted to the idea of developing a signature (method?) based on cool, high contrast compositions. I'm not sure where I'm going with this yet but it feels like a move toward something more streamlined. And I'm not averse to repeating myself. If a look makes me feel good, it gets multiple outings. All but one of these has been out and about more than once this season. First out of the box is a favourite look which I've been wearing for a few years now. One of my go-to summer looks, a top and skirt I made myself that always demand to be worn together. Sandals by Trippen. The second is a reproduction of a vintage Issey Miyake design from the early 90's. I cut the pattern ages ago and I finally got around to putting it together last month. I made a few modifications as I was going along, substituting an open necked collar with a high neckline and introducing a fly front with some stitching detail. The yoke, bib and cuffs are made from a textured poly cotton blend, and the body and sleeves from a sheer batiste. I'm pretty happy with it but dreading the first wash.
Third look is a piece I made from a Jean Charles de Castelbajac design that turned up improbably in Burda last Christmas. I used felted organic wool and trimmed it with leather left over from another project. It has a very interesting pocket detail. I thought it would be a winter garment but it's turned out to be a very useful topper on cooler summer days. 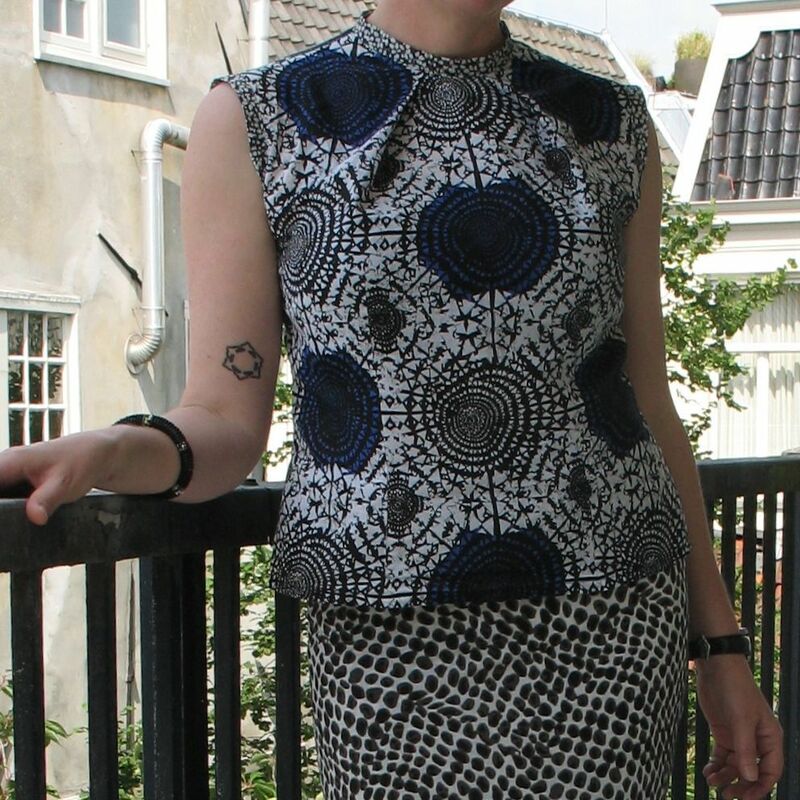 Worn with a vintage plisse skirt and a tee-dress I bought in Barcelona. Fourth is the one I'm least sure about, a printed tee with a chambray midi from House of Holland and sandals by Bernhard Wilhelm for Camper. I love the pop-art vibe of the two prints together, but I wonder if it looks a bit juvenile. As ever, your wise and thoughtful feedback is much appreciated.